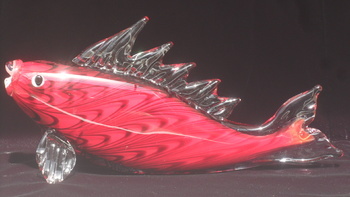 Art Glass Fish ~ Red & Black ~ 13"
In Art Glass > Studio Art Glass > Show & Tell. 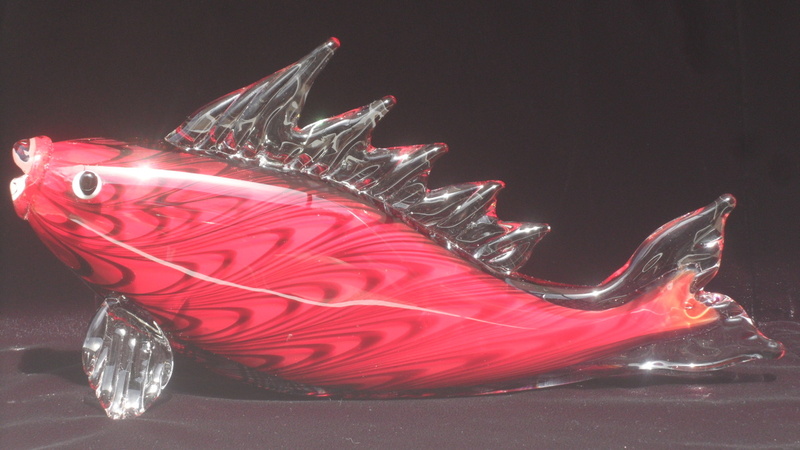 My Red Fish. I find it to be quite beautiful. I did a lot of research on it and found it to be quite similar to Sommerso. Took it to an "expert", he said he wasn't sure what it was, that it might be Italian, Venezuelan, or maybe a Studio piece. I've not seen another like it. I'd love to hear opinions on this piece. Thank you, I appreciate it. Dean. Thank you Sean for the "Love it" click and the compliment. You da man! 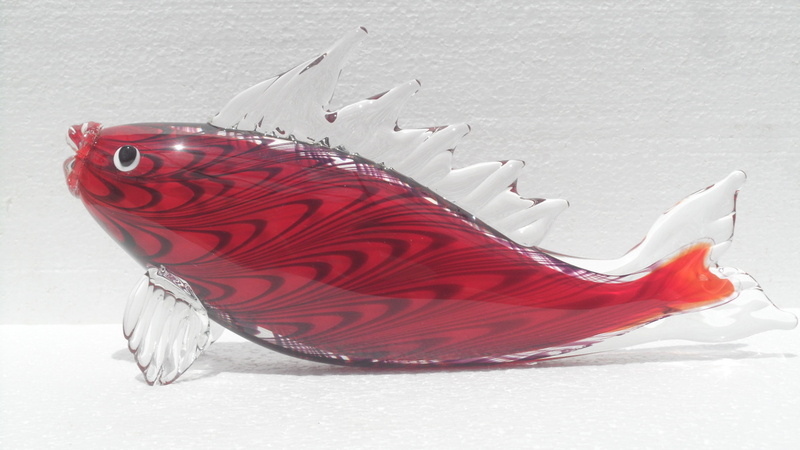 Loveliest glass fish I've seen! I find fish hard to figure out. 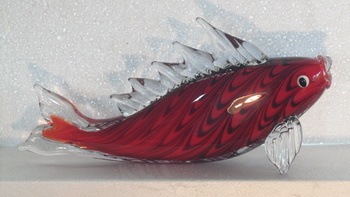 I had a fish piece here at home that I have never figured out, and others do not know either.......Guess I should post that one too....LOL. 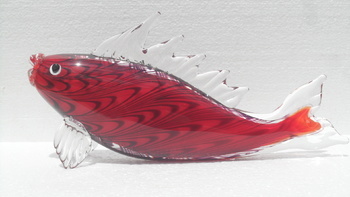 It is a more upright fish with colors......so I am ??? on that too. A great fish Dean - sorry I can't help with ID. Like many of my pieces it's a "I really like you but don't know who you are" fish! It's very nice and unique. I ran around the house looking at all my fishes, and can't find any similar craftsmanship in the collection. Great colour. A spawner. Thank you for the Like, and Loves, fernpig, KatherinesCollections, MelanieJ, Blunderbuss2, TrudiCakes, Vetraio50, antiquerose, Racer4Four and Collectomaniac, it is very appreciated! Thank you Sklo42 for the "Love it" click. Thanks for the nice comments by Sklo42, Melaniej, Racer4four and Collectomaniac. 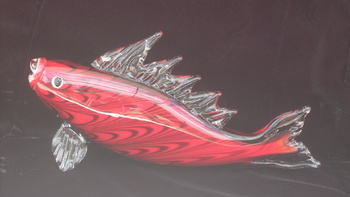 The fish is interesting to say the least, the color and pattern are unique. Maybe some day, someone here will have an ah-hah moment and the mystery will be solved. I appreciate the positive thoughts from you all. Thanks. Thank you Jscott0363 for the "Love it" click. Thank you Petey, KatherinesCollections and Ho2cultcha for the "Love it" click. Thank you Trey for the "Love it" click.